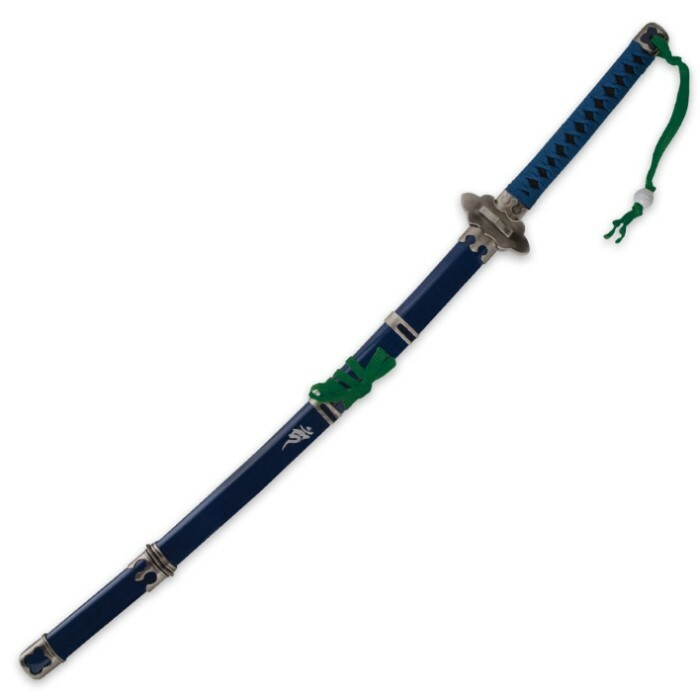 Features include an oversized Tai Chi style guard with matching silver fittings, a hardwood handle with black faux ray skin and blue cotton wrapping, and matching hardwood scabbard which is finished in blue.The carbon steel blade has a natural satin/silver finish with matching collar. 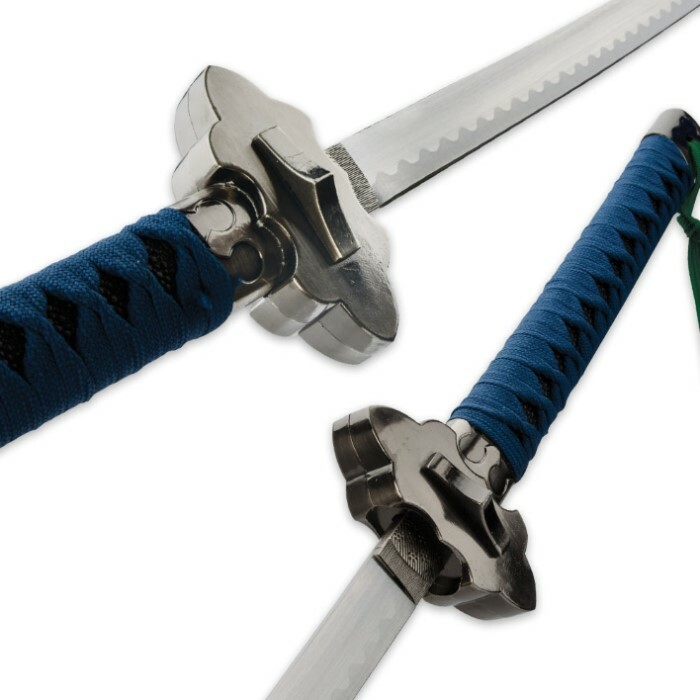 In terms of katana sword design the combination of blue, emerald green and silver is not common, yet this piece shows how well those colors come together. This unique design is sure to stand out in your sword collection. The guard and fittings are all metal construction, and to help keep this piece affordable the guard is using a hollow construction instead of being solid. Please note: Our current stock of this sword is using lime green color wrap on the very end of the handle (the streamer) and on the scabbard. The handle wrap itself is still blue per the photo. i like the sword very mush . i had to get the sword for my self, my street kid told me about the anime blue exorcist, so i had to watch the show & liked it a lot? First off, I know the sword is the main draw, but let me say that the scabbard/sheathe is perfect in every way. I may have just been lucky, but the metal parts on it came perfectly safe, stable, and clean. and the attention to detail was amazing. In the sheathe its a 10/10. I'm a fan of heavy blades, and this one is almost so light it could float away on a breeze, but because of the Tai Chi guard and the size of it it just feels so right to me. I love it. My only issue is it came a few fractions of a centimeter bent (nothing i couldn't fix in seconds) and the blade when you really study it tapers to a standard Katana end but it looks a little uneven, but otherwise its perfect and the two-three faults it did have are minuscule in my opinion. The sword came on time and looks amazing. I have no problems with it so far and love it. The blade is not too sharp but what are you planning on doing with it. Around I love the sword and am very happy with my purchase. The blade itself was an in good shape. It's by no means durable as far as crossing steel with another sword but overall it's amazing. It's also kind of hard to play with because the bead at the end of the cord will hit your hand lol. Nonetheless, it's a good blade. The middle ring on the scabbord is probably the only cause for real concern but that is something you can easily fix. I just received this sword in the mail today and could NOT be more happy with the quality! The only slight complaint I have is that one of the details on the scabbard was loose and sliding around. But past that(which was easily fixed with super glue) the blade is beautiful And I am beyond proud to have it hanging on my wall! Thank you Budk for the amazing but and as a first time customer I am deffinently returning for more! Ordered this on 5/15, received it on 5/21. It's not as advertised, no faux ray skin, streamer is nothing like the anime at all or the picture displayed, it's just a tiny little thing with the ball at the wrong place. Fittings on the scabbard were glued on and arrived loose. the fitting on the scabbard mouth came off when unsheathed. the scabbard itself doesn't have the little manji design or whatever painted on, it looks more like it was cut off the wood or it's a very secure plastic sleeve on the scabbard... although the fitting on the scabbard did come with a knob which was nice even though it's not pictured either. It does look pretty but the problems with the scabbard (the loose metal fittings scratched up the scabbard and the missing faux rayskin bothered me a lot. The streamer being wrong really killed it for me. The blade is what you can expect for 30$ so I can't complain but it looks nice enough as well. Although I'll be returning this item, the customer support was amazingly fast and did a great job. giving it 2 stars cause the knob was really nice to have, just don't expect what's pictured here at all and you'll be fine. I got this some time ago, but have been lax in writing reviews. This is a beautiful weapon, as if it fell out of the anime right into my lap. It does have some resistance when trying to pull it from the sheathe, but I feel it adds to the personality of the blade. After all. In the anime, drawing the sword was something he was trying to avoid, as it revealed his heritage. So it makes sense that the blade would be slowly more secured to avoid the possibility of it accidentally slipping out. Kind of looks like the sword used by saeko in high school of the dead, now that I think about it could you guys please make a hand forged version of saeko's sword please? Response: We'll see what we can do!